We're excited to announce the addition of more than 1,000 books on instruction, history, strength training, and the mental game. This comprehensive golf library at the Learning Center is sure to offer instructors and students excellent resources to improve your game, not to mention some all around "classic" golf reads. 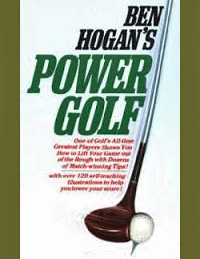 Ben Hogan's Power Golf is an oldie but goodie. Our focus will be on pages 130 and 131 which have great drawings and explanations of impact. 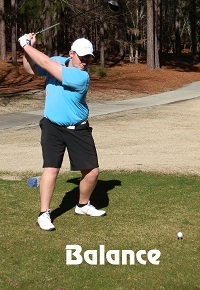 He says, “At impact my hands are ahead of the clubhead and the ball is being struck a hard descending blow. Hit the ball first and then take the turf.” This is so important to understand because if you can arrive at the ball with a positive lean of the shaft you will compress the ball like you’ve never done in the past. This is why the tour players hit their seven irons as far as a four iron and the high handicapper hits his like an eight iron. The average player hits blooper shots with no ability to penetrate the wind. This inability makes a typical breezy day at Applecross a major challenge. You can borrow this book from our Learning Center golf library or purchase it on Amazon by clicking on the book cover to the left. 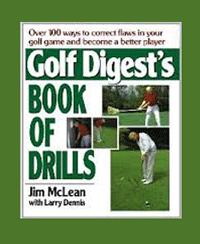 This Recommended Book is a Golf Instructors treasure. 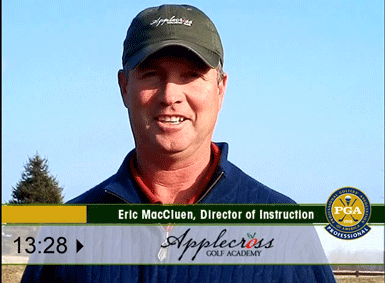 In Golf Digest's Book of Drills there are tips inside that would help just about any golfer. The trick is in knowing which ones to use. On page 140 and 141 there are great images of properly extended arms which I’ve noticed is the downfall of most of our membership. Here’s the drill. While using a mid-iron, tee up the ball about an inch off the ground. Assume your address position. Without moving, have someone step in and move the ball 6 to 12 inches further forward in your stance. Make your normal 3/4 length backswing but when you swing through you’ll find it necessary to straighten both arms in order to reach the ball and strike it solidly. It takes a little practice but it will pay off with a significant increase in distance. You may borrow this book from our library or click on the book cover to the left if you wish to purchase this book from Amazon. 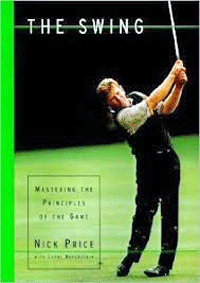 This recommended book is by Nick Price called The Swing. It was printed in 1997 when Nick had reached number 1 in the world. It is filled with great life stories and wonderful images of his swing during his period of change. I have used pages of the book for reference on many occasions. One of my favorite sections in the book is the journal which he kept all of his lessons with his instructor. Too often our students don’t record their thoughts and feelings during a lesson and they are soon forgotten thereby wasting valuable time which you can’t ever get back. This entire book is a guide of Nick’s golf experiences. It contains detail of trials and tribulations, not just the glamour of being number 1. The exercises and tips are awesome and warrant a read. Give it a try. I know you’ll enjoy it. 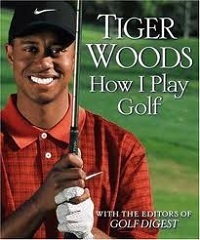 You may borrow this book from our golf library or click on the book cover to the left to purchase it from amazon. 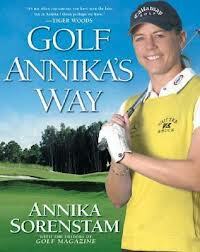 This recommended read is Golf Annika's Way by Annika Sorenstam. There are many great tips and anecdotes in this one to occupy you for a long time. This book covers the gamut from short game to long game and everything in between. We are focusing on pages 60 and 61 which would make many of the old style teachers want to roll over in their graves. On these pages Annika talks about how she developed her signature head release prior to making impact. This move also goes with our monthly video to help you get off of the back leg and get your weight properly shifting to the target. 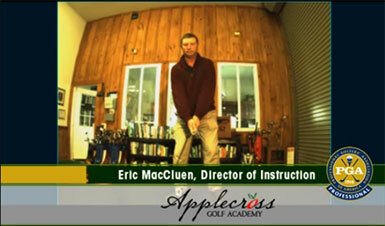 Give our video a look and maybe you’ll see something interesting and helpful with your own swing! 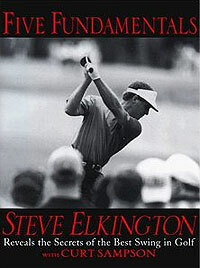 You may borrow this book from our golf library or click on the book cover to the left to purchase it from amazon. For those of us who live in colder climates, practicing fundamentals can be done indoors several days a week. Since your hands are the connecting point between you and your club, perfecting your grip will naturally add precision and greater power to your Spring game. I had used an old golf club with the shaft cut off and the end taped (to cover sharp edges) to practice my awareness for how a correct grip "feels". 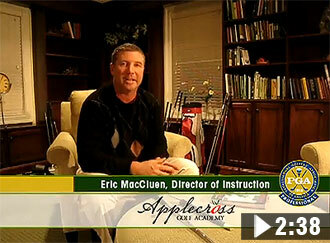 If you'd like help developing your golf grip, you can certainly book a lesson. As I show in the January video clip below, I would start by holding the coins between my thumb and forefinger to practice getting your hands ready to team up in the proper position. If you need a cutoff grip, send me a note and I can leave one for you in the shop. If you would like a small club let me know and I can have one for you quickly. Just pay for the price of the new grip that I will have to put on. Applecross Facilities, Practice = Improvement! Practice is a game Changer and winter means time to rev up your practice routine; a solid routine moves you along from “thinking” about your golf swing to "feeling" it. The colder months offer a great opportunity to make adjustments while practicing without the pressure of performing on the golf course. Instruction is available indoors at the Learning Center and at the Pulte Welcome Center thru the off season. 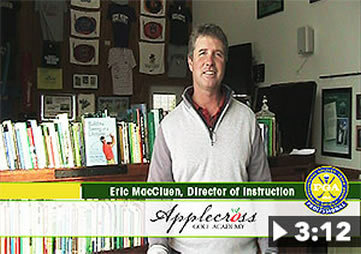 As we transition into the regular season, the many practice areas of Applecross such as the Driving Range, the main Putting Green, the putting green and bunker around the Learning Center as well as the fantastic 19th hole offer tremendous opportunities to work on the skills acquired during your lessons. Practice "Proper Distance from the Ball"
Practice "Steady your eyes to help your putting"
grip from the book, "Five Fundamentals" written by PGA champion, Steve Elkington (1998). 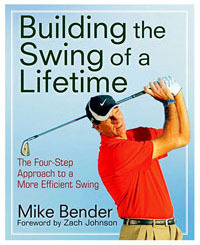 "Building a Swing of A Lifetime"
In this video, I talk about practicing good aim with the tips taken from the book, "Building a Swing of A Lifetime" by PGA Instructor, Mike Bender. In March of 2013, I had the pleasure of working with new student, Todd Darlington. Todd was gracious enough to allow me to document his progression over a five day period. 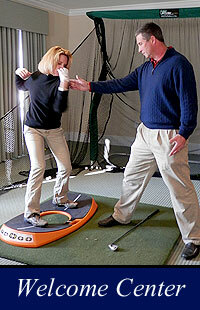 This project was for a seminar I was doing for the Philadelphia Section PGA on March 4th. In the video I showed the drills that I had Todd do during each day. As the days progressed, his impact, distance and trajectory changed dramatically. The average distance of a seven iron began at 125 yards and increased to 145-150. If you follow the video all the way thru you will see different activities that worked for Todd and they certainly will work for you too. 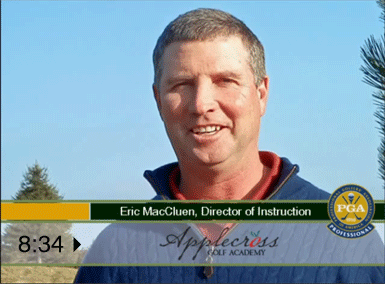 The Learning Center at Applecross is your opportunity to learn practice drills for home or on the driving range that turn a proper pivot into a habit that you'll bring to the course this spring. In this clip, I talk about drills that anyone can do to make a difference with balance during the off season. In this clip, I talk about drills that improve impact. In April of 2013, I had the pleasure of working with Applecross member, Stephanie Giampietro. Stephanie was gracious enough to let me document her progress as we make our way through a series of exercises over a three week period. If you follow the video below all the way thru you will see how we changed certain habits to better her contact and club head speed. In this clip, I show you drills to better your impact positions. 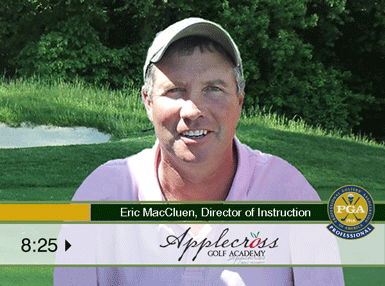 In May of 2013, I had the opportunity to spend time with Deanna Suarez, a member at Applecross CC. She was nice enough to let us document her progress as she works through the changes. Deanna has just recently begun playing but you can see the potential is there for really good golf. 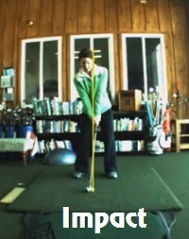 The focus of the video is on improving her impact positions which are typical deficiencies, especially in a new player. If you watch the video all the way through, you will see the drills that we do and how the exercises change the motion. We use these drills during many lessons so I know they work. Try these yourself and see if it can help your impact and your scores. Good luck and enjoy the video below. The focus of this video is on reaching maximum and proper arm extension through impact and into the finish. I had the opportunity to spend time with Dee Lentz and Eric Hottenstein who had allowed me to document their lessons. As you follow along watching the video you’ll see drills and focus points that helped them create proper arm extension and change their swing for the better. Have one of your friends video your swing on the course and see if maybe these drills could help you too! Enjoy the video! 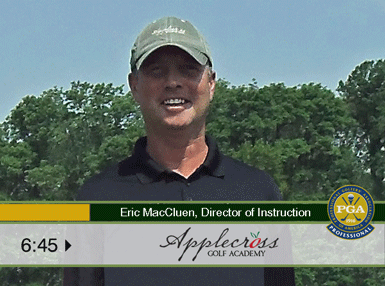 In July's clip, I show you three drills to increase power and consistency. In the July video I am focusing on a few different ways to increase your power and consistency. The student is Elizabeth Bjorkland who, at the time of taping, has literally been playing for just a couple of weeks. She’s a quick learner, already grasping the basics. With a little help I think she could be a fine player. The drills which I use with Elizabeth are drills which can help anyone. The pivot drill can be done with any stick or even a long club. It doesn’t have to be a piece of pvc piping but it certainly can be. The taped ball drill was taught to me by Art Sellinger who is a World Champion Long Driver. It’s an awesome drill for feel of the weight in the club head and proper timing of the wrists. It was obvious that it helped Elizabeth to feel better wrist action and make better contact. Give the video a look and see if the drills can help you too! 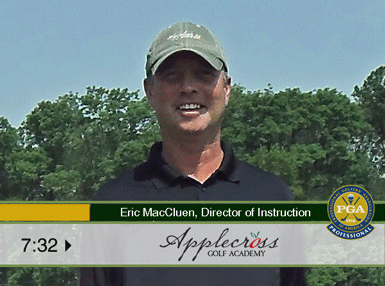 In this clip, I'll show you simple keys to help your follow through. When viewing these tips please be patient and allow them to load.